Iron Maiden have teamed with Onkyo for a new venture called Maiden Audio. CNET reports the brand is being introduced at the 2015 Consumer Electronics Show in Las Vegas this week. 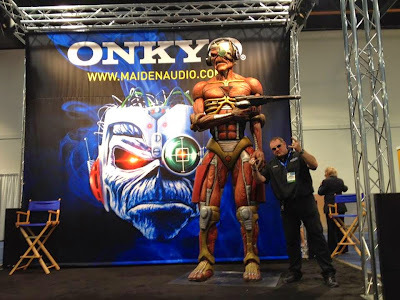 A Maiden Audio booth is featured at the annual event, complete with a giant-sized version of the group’s mascot, Eddie, who can be seen wearing the new line of Iron Maiden headphones. The band are said to be closely involved with Onkyo in the creation of Maiden Audio products, with more details expected to be revealed in the next two months. Iron Maiden wrapped up their Maiden England world tour last summer, a trek that saw the band play 100 shows to more than 2 million fans in 32 countries over the course of the 2-year run, which began in June 2012 in Charlotte, North Carolina.